This entry was posted in "Four legs good", Attempt at a Review and tagged Endymion, Penhaligon's, Savoy Steam. Bookmark the permalink. Second Sunday Samples – hooray for this new feature! And how cute is that Rusty? I was just at the Penhaligon’s boutique at the WTC and the SA there was just the perkiest SA ever. I think I sniffed Savoy Steam if that is the one that is supposed to smell like a Turkish bath; it was pleasant enough but nothing distinctive. I saw 3 more (or maybe 4) of the Portraits collection and liked Clandestine Clara enough to ask for a sample. As the SA was making it at the counter, I saw boxes that I originally thought were sample sets. They turned out to be Travalo atomizers which the SA can be filled with the perfume of my choice. Would you believe that some people thought they can just keep going back to get it filled? Anyway, i ended up getting one and having it filled with Clandestine Clara. P.S. I LOL’d at your comment about calling Savoy Steam Savoy Cream because something about the Penhaligon’s perfume names kind of make me want to call them something else. I kept calling Clandestine Clara Clairvoyant Claire . Go figure! In general, I’m surprised they fill it with anything in the first place – though, if to think about it, it kind of makes sense: it’s almost as I’m paying to test their perfumes. Atomizer costs enough to cover both the device itself and 4-5 ml of perfume it holds. If I end up not liking it, I cannot really do anything with the atomizer. So there’s a good chance of me coming back to get a bottle once I’m done with the originally poured perfume. But it is funny that anybody would expect a free refill. you lucked out because the SA at Rock Center would not give us samples and was quite perturbed that my mom and I did not buy full bottles (one for each of us). The Rock center SAs were generous at Sniffapalooza, probably becuase it looks like a mob scene whenever we’re there! Interesting you choose this brand for a review, Undina. I tried the Portraits series but they were not exactly my taste. Honestly none of their new releases are to my liking. But I do like Malabah, I believe it was released in 2003 and Cornubia which has been discontinued. Haven’t tried Savoy Steam so who knows? Rusty is adorable as always! I’m not a big fan of the brand though I liked several of their perfumes. These just happen to be the first samples that I thought of as I decided to do this feature. Also, had that been my favorite brand, these samples might not have ended up featured in that series. I have not tried Malabah though I saw that it was one of perfumes that others liked. I completely agree that Endymion is not macho perfume, and I like it because of that. The Revenge of Lady Blanche was my favorite “portrait” but I do not like the bottle’s top (in addition to the fact that it’s a 100 ml bottle). I think the name Savoy Steam is great! There is a range of vintage sanitary ware over here called Savoy, so it has a pleasing bathroom vibe for me. I don’t think sweetness would be an obstacle for me, and I am curious now. I have tried Endymion, albeit a long time ago, and think I dismissed it as a bit oldfashioned smelling. But that was then…I probably have a sample in my deep storage, so will dig it out if I can. Am glad you have access to the brand locally now. There are many scents of theirs I have enjoyed down the years. I expect they will do well over there with their very overt English heritage. I thought you might have warmer feelings towards that perfume for that bathroom connection ;) In the name of not hoarding things that didn’t work for me, I can forward your way what’s left from my sample with the next mule run. 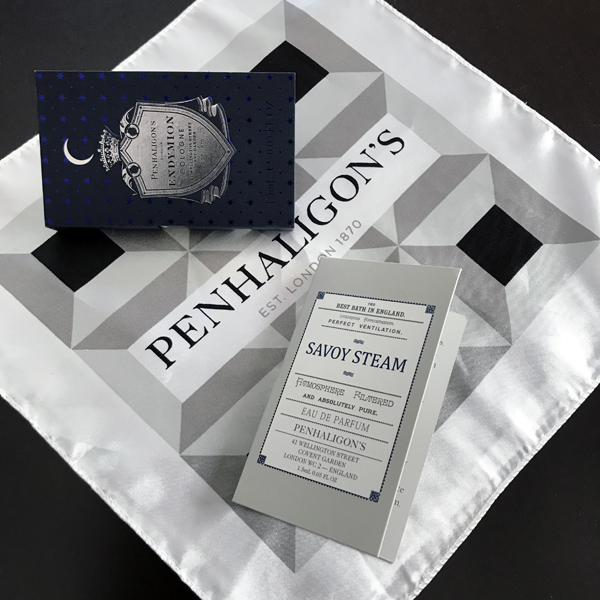 I sort of lost faith in Penhaligon’s – since they were taken over by Puig they started releasing incredibly high number of perfumes of which many seem very similar to each other… But Savoy Steam sounds nice. I like clean perfume and maybe I would not mind if it smelled of shaving cream. I think you might actually like this perfume but definitely not enough to think of paying the price: I do not think it’s even close to be worth of what they want for it. Not because it’s bad perfume but rather because it’s not the type of perfume, for which one splurges. Great new feature, Undina. Penhaligon’s is a funny one. When I lived in London they were still this cutesy brand with Soliflorals, classic colognes and a history. I’m curious to smell the new orientals from them, but I’m not having too much hope, I think they are more pleasant than FBW. I did like the new portraits series, especially the combo of hyacinth and Iris in Lady Blanche (I think it was that one), but it did remind me quite a bit of Bas de Soie. The Revenge of Lady Blanche is my favorite from the bunch so far. It’s interesting, I didn’t think about Bas de Soie – I need to try those side by side. The older bottle of BdS is much more reasonably priced. And I agree with you on the FBW’ness front. Even at a heavy discount, for most of their perfumes I’m still thinking if I’ve got either skin time or shelf space for the bottle. I love that we have both recently written about Penhaligon’s! I haven’t tried either Savoy Steam or Endymion, but I will think of your write-up if I come across them. This is a nice new feature, by the way. I look forward to reading some quick impressions of what you’re sampling! It’s always interesting to hear about what other people are testing. It must be something in the air! Portia has also just written about Savoy Steam (if I’m not mistaken, on the same day as I did). I’m also usually curious about what others are testing – especially when those are perfumes that people actually chose to test (vs. got sent by PR people or the brand for the consideration). Though impressions on the latest releases are also useful, if I trust the writer. I’ll have to look at Portia’s write-up too. How funny! I completely agree, I love hearing about what people have chosen to sample/test/wear. I like reading about older releases and the discontinued-but-not-forgotten scents. It doesn’t always have to be about the newest and the latest! Love this new addition, Undina. Looking forward to more. I am very keen to try Savoy Steam. You mentioned samples. Why have these become so precious and scarce? Whenever I am out and about, I ask for a sample. And they are seldom available. Samples became commodity. Look at eBay: Penhaligon’s samples are sold for $3-$5 + shipping, so there are a lot of people who’s getting those samples to re-sell them or to use whatever they got and never go back for the actual bottle. I can understand SAs not giving out the samples left and right but they should have some feeling as to who might actually be coming back to buy that bottle after trying perfume for a while. And definitely they should be much more generous with people who are already buying a bottle: it used to be that with every perfume purchase you’d get 5-7 current samples for you to try and see if you want anything else. Nowadays it’s a miracle to get anything with even full-price purchase – unless you do it from the SA with whom you maintain relationships. Pity. i have no shame :-) because goshdarnit, if I am paying full price at a brick and mortar store, I should get some “freebies”. I always ask for samples of others of the brand that I bought AND also ask the SA to help me procure several others by walking with me to the other brands’ counters. When I order via phone / email / text with SAs at Bergdorf and Barneys, even if I didn’t buy any perfumes, I always ask for several specific perfume samples for them to include with my stuff when I either pick them up or have them mailed to me. Same at Saks Fifth Avenue…years ago the SAs practically threw samples at you…now they look at you as though you have three heads when you ask for a sample…none to be had at Tom Ford, Jo Malone or Annick Goutal..all claimed to be “out of samples”….I am wondering if the SAs hoard them and then sell them on ebay? Or am I just a cynic?-LOL! I’m sure that many SAs (not all, of course) or their close friends and relatives are finding a much better use for those samples than just hand them over to the general public. I actually stopped getting samples from a friendly SAs at the local Nordstrom because I felt an obligation to buy from her something at least once a year – but our local store does not carry enough interesting brands for me to do that, even if I were not trying to get those perfumes cheaper elsewhere. So in the end all those Muggler and Jo Malone samples wasn’t worth much for me since I tried them already and didn’t want to buy. I love this new feature!! Looking forward to many more Second Sunday Samples! Thank you, Lavender. We’ll see how it goes. Love your idea for this new series! Penhaligon’s Vaara is my favourite from the ones I’ve tried. I got it from a friend for £20 and wear it a lot in milder weather. The Portraits concept didn’t grab me but Duchess Rose is perfectly nice. Thank you, Tara. Glad to see you: I hope your vacation is going great. I’m not ready to consider Penhaligon’s perfumes as luxury perfumes – hence my reluctance to pay their original prices. But I’m happy with the couple of bottles that I got on sale. I think I have Vaara sample, and I should re-visit it – I had it somewhere on the back of my mind after either one of your posts or comments. Hi Undina, I’m just back from travels and catching up on email so just saw this post. I’m sorry the Savoy Steam didn’t agree with you. I’ll have to go back and reread my review and see what I said about it. I recall liking it as a “neutral” but thinking I might purchase if it came to a discounter like some of the Penhaligons do. They , like many other brands, seem to have hiked their prices in the last few years. As always, love the Rusty pics! I don’t know if to feel sorry when somebody doesn’t like some perfume or when they do: how many more bottles can each of ours collections take in? :) I hope this one goes on sale and you’ll be able to get it. 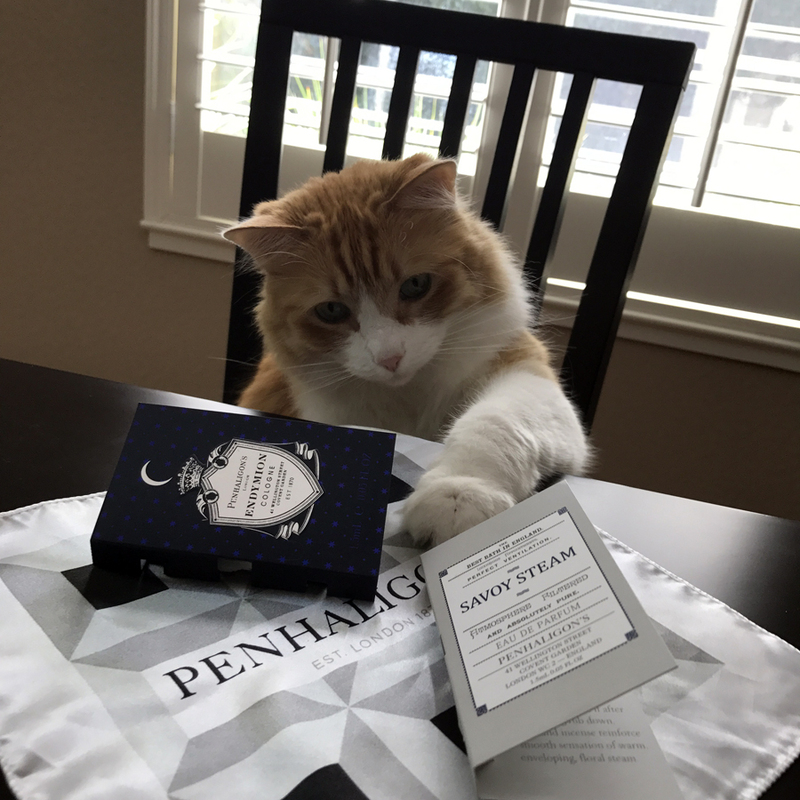 Penhaligon, plants, scents and language…Undina’s reviews are always a pleasure. It’s great to see you here. Hope you’re feeling better.